It's a whole new Word, so jump right into this book and learn how to make the most of it. 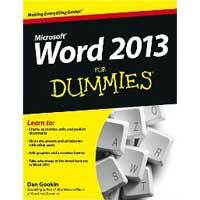 Bestselling For Dummies author Dan Gookin puts his usual fun and friendly candor back to work to show you how to navigate the new features of Word 2013. Completely in tune with the needs of the beginning user, Gookin explains how to use Word 2013 quickly and efficiently so that you can spend more time working on your projects and less time trying to figure it all out.